The TS-332X also provides a 10GbE SFP+ port, three M.2 SATA 6Gb/s SSD slots, and supports SSD caching and Qtier auto-tiering technology. “The TS-332X is a small NAS, but it is packed full of competitive features,“ said Dan Lin, Product Manager of QNAP. The TS-332X uses an Alpine AL-324 quad-core 1.7 GHz Cortex-A57 processor, features 2GB/4GB DDR4 RAM upgradable to 16GB and comes with a 10GbE SFP+ port to provide compatibility with high-speed networks. The TS-332X supports up to three SATA 6Gb/s M.2 SSDs with 2280 form factors, allowing users to create a high-capacity SSD cache for boosting IOPS-demanding applications, or RAID 5 tiered storage. Block-based snapshots enable comprehensive data protection and instant restoration, providing a modern way for users to effectively mitigate the threat of ransomware, according to QNAP. The TS-322X NAS is available now. 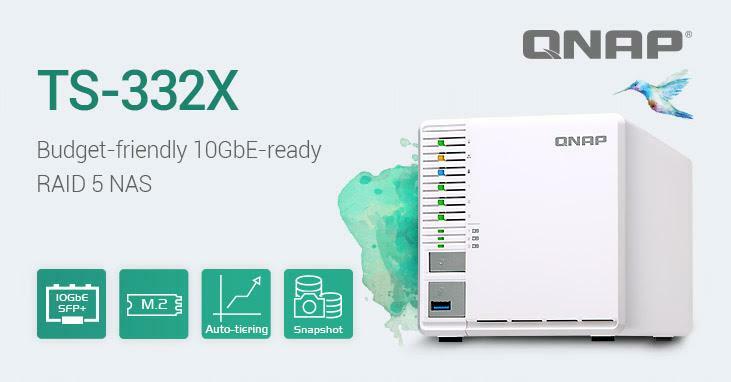 For more information, visit www.qnap.com.